This product includes: (Mid 2011) MacBook Air 13" 1.8GHz "Core i7" processor (2677M) with two independent processor "cores" on a single chip, a 4 MB shared level 3 cache, 4 GB of onboard 1333 MHz DDR3 SDRAM (cannot be upgraded later).Hard Drive:256GB SSD Drive.Built-in iSight camera. 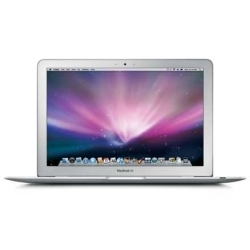 *The MacBook Air does not have an internal optical drive. Video Card: Intel HD Graphics 3000(Apple reports that "memory available to Mac OS X may vary depending on graphics needs" and that the minimum graphics usage is 384 MB with 2 GB of onboard RAM and 384 MB with 4 GB of onboard RAM. ).Built-in Display:13.3" Widescreen.Native Resolution: 1440 x 900.Two 480-Mbps USB 2.0 port, no Firewire ports.AirPort Extreme (802.11a/b/g/n) and Bluetooth 4.0 standard.Preloaded Operating System: Lion 10.7.Ac adapter included.Pre owned. fully tested.90 days usedmac warranty.